Build a system to learn and recognize faces efficiently and accurately. A stack of research papers, an Olympus 340R digital camera, a few computers, and whatever time was leftover between our other classes. 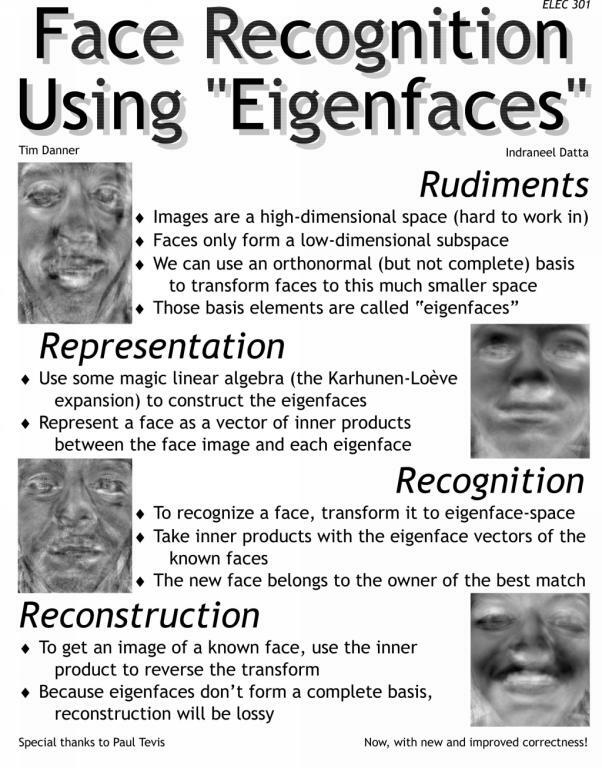 Intro - Details about what we set out to do, how we decided to do it, and some of the history of the eigenfaces technique. Proposal - Of possible "historical" interest. This is the proposal that was submitted when the project was assigned. Decide for yourself whether or not we met our goals. Algorithmics - A more in depth explanation of how the system works. Results - Did it work? Click here to found out! Code - Read the wonder that is our system. It's in Python, but I've always found Python to be very readable. Some people even call it "executable pseudo-code". Images - Lots of images. Here you'll find the original face images (86 of them), and the 50 eigenfaces we generated from them. References - See how we got to where we are. And feel free to email us if you have any questions!